In fairness, the economic data has turned south recently, at least relative to market expectations. Somewhat ironically, the Citi economic surprise index peaked the day after the March FOMC meeting; whether this represents incredible forecasting acumen, the deleterious impact of the Fed's "Debbie Downer" attitude, or mere happenstance is up for debate. The irony, of course, is that markets have generally performed ideally (from the Fed's perspective, at least) since the March meeting, as we saw yesterday with the financial conditions index. Today's announcement will therefore be a useful gauge as to the relative weights that the Fed gives to short term economic developments vs. financial developments. As Macro Man observed yesterday, it seems likely that the committee will wish to keep the door open for June, even if they do not currently intend to walk through it. After all, the meeting is just a week before the Brexit vote. In any event, yesterday the two month vol date captured the referendum. 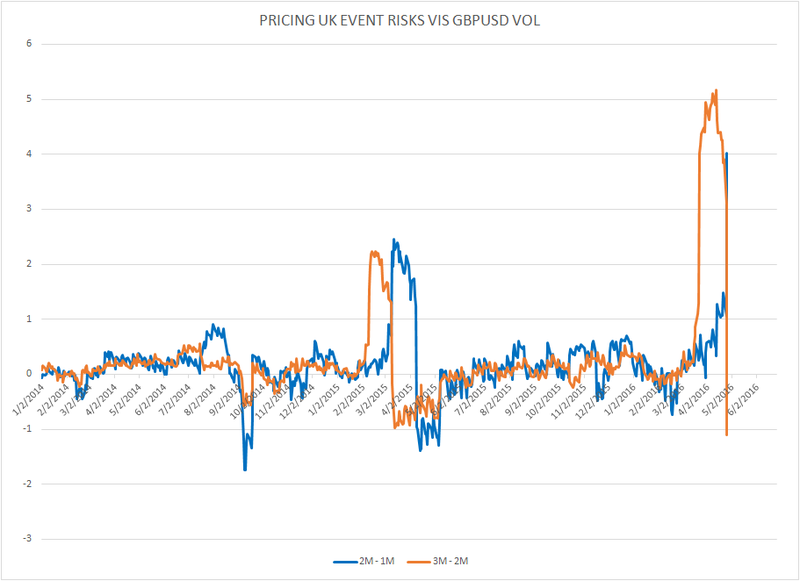 We can approximate the amount of event risk priced by comparing the spread of 1m vs 2m cable vol with that of 2m vs 3m. In doing so, an interesting picture appears. As you can see, when the 3m date first captured the referendum, its vol premium to 2m comfortably exceeded the current 2m premium to 1m, even though you'd expect the opposite given the lower vega of short dated options. The contrast versus last year's election can clearly be observed, where the shorter-dated spread exceed the peak of the longer-dated one as soon as it captured the election. That this hasn't happened this time would suggest complacency, a growing conviction that the outcome will clearly favor the Remain camp even before the vote, or fatigue at the cost of insurance. Quite possibly, all three are playing a role. As for markets, today is shaping as a three way Battle Royale between the Fed, the BOJ, and lousy corporate earnings. Apple was the latest company to disappoint after the close yesterday, with shares dropping a quick 8% as a result. As noted a few months ago, it can sometimes be difficult to disentangle general weakness in global demand from a specific disenchantment with Apple's particular suite of offerings. Samsung's announcement (due tonight) will hopefully shed some light on the issue- Macro Man is far from an expert on consumer electronics, but some combination of the two factors seems a likely explanation. More generally, tech stocks continue to struggle to regain their luster. 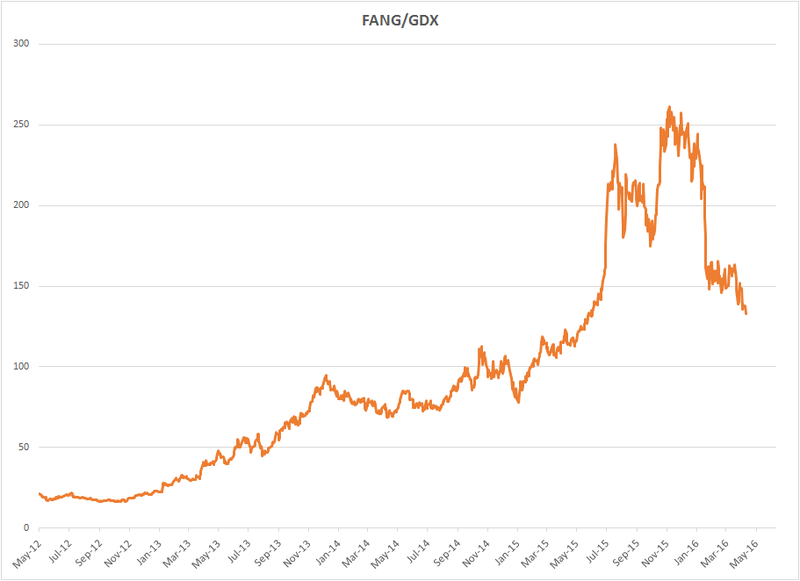 While FANG has generally enjoyed the upswing over the past couple of months, it has yest to recapture its previous giddy heights. While it's generally dangerous to forecast technical chart formations before they actually materialize, it's hard not to see the potential head and shoulders formation shaping up for FANG. When Macro Man looked at the FANG/GDX spread in early February, he observed that after a precipitous decline in the ratio, price symmetry might suggest a bit of a breather. 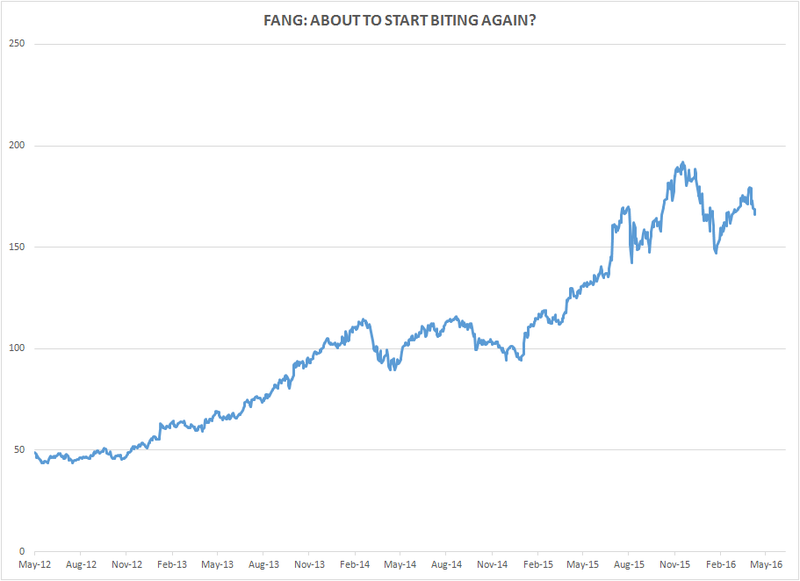 Sure enough, that's more or less what ensued...but recently it looks as if the spread is breaking down again. As for the BOJ...it's a tough one to call. What will they do? How will the market react? There are too many permutations to have a strong view without putting some quality thought into it. Macro Man intends to do a bit more of that today, and if he comes up with anything he'll scribble down some thoughts ahead of the announcement. Stocks consolidating before FOMC... watch them all break out to new highs following a dovish Fed and even more dovish BOJ tomorrow. So many people still haven't understood that our politically-driven central banks are going "all-in" regarding loose monetary policy. Good luck fading that trend. A big energy hedge fund manager told me that Schlumberger (SLB) just pulled all their people out of Venezuela because they haven’t been paid. Oil production there will go to zero, taking prices up to $70/barrel by yearend. As for natural gas, its price is going to negative numbers. I suspect we'll see a correction sooner than later, but as the first anon just posted, it is pretty evident that the CB's are all-in. However, in a practical sense they've been all-in since 2008, and it appears debt deflation may not be stoppable. Would you have even had an inkling that NIRP would appear back in 2008? I see the Gundlach has suggested it is time to buy bonds. Are you doing the same? anon 12:01 - Yep oil is being bought aggressively the last few days, regardless of inventory build - someone knows something. anon 1:09, yeah I think it's called the Chinese moneyball moving to commodity futures. I wouldn't assume anyone knows anything. I think I will sit out this one. Riding the last 2-5% of this rally doesn't look that enticing with the risks to the downside if it does not materialize. But then we do have the fed up and they are usually good for a rally for a day or 2. So my play will be to wait for the end of the week after any rally and look at short positions in oil, Spoos and long dollar after the final burst up, if there is one. If Yellen is more dovish than expected, I would be concerned that GDP later in the week will be a stinker. Fed roulette - just about the same outcome as chatroulette. @Boog am I the only one thinking the Fed matters a lot, lot less this week than BoJ? I feel this market, instead of reacting to any individual news, may absorb all the info till Friday before making a move one way or another, which means probably best not to get involved in this landmine of a market next few days. Bizarre how this Q2 is like last Q2 in that the rally up to the highs has been led by a short squeeze in energy and (till a few days ago) admiration for big tech, with good participation from others no doubt - the big difference, of course, is that crude has gone from 27 to 45, not 45 to 63, and tech earnings are rolling over, not blowing everyone away. Of course, as various anons have graciously reminded us, worsening fundamentals just means friendlier CBs. But isn't that the same as being told your Mom, who already loves you unconditionally, now additionally says a prayer for you every morning? BBG: ECB plan to buy corporate bonds spurs long-term issuance. B in T, fixed income is a watch-and-wait situation at the moment. Not overbought, but not dramatically oversold yet either. There are some yield levels in 10s and 30s that would certainly increase our interest, for sure, and they are not that far away. We and others would probably start nibbling at 2.00% on the 10y, 2.75-2.80% on the 30y, especially if certain technical factors appear. For now let's wait and see if the Reflationistas have one more bullet left. Can Dame Janet REALLY be more dovish than expected here? I mean, is that even possible? Now look at the charts for the Caddy, and imagine what happens if oil turns down again and Bucky bounces, eh? @washedup says: "But isn't that the same as being told your Mom, who already loves you unconditionally, now additionally says a prayer for you every morning?" @ Punta, that was spit-take worthy. @Anon 2.36, Bear in mind that those higher EZ issuance numbers are still peanuts compared to the US; corp issuance in March alone was $145 bio, with an average maturity of more than 14 years. If indeed the Chinese ball of money is chasing commodities, then the soothsayers at the Fed may be seeing inflation in the near future. Those Fed analysts are really, like, really, really smart like that. They have like ESPN or something. I continue to look for a slightly hawkish statement. “Helicopter money is going to happen,” says Gundlach. - then shorted China, because it makes total sense to fade a central bank with unlimited firepower. Unfortunately when doves cry, they also unleash monetary easing on an unprecedented scale, wiping out said shorts. For this alpha-seeking charade, you have been charged 2&20. You're welcome. "Bear in mind that those higher EZ issuance numbers are still peanuts compared to the US; corp issuance in March alone was $145 bio, with an average maturity of more than 14 years." Yep! This is the key. Net issuance, 12-month average, in the EZ has been running at about €4B-to-€5B a month recently, which is trivial. Historical high is €12B if I remember. These data are released with a significant lag, but issuance will go up. The key as MM alludes to, though, is how much. The U.S. is the big daddy, and will continue to be. If U.S. issuers shift into EUR funding, and the ECB finds a way to buy that ... it could get interesting. @anon "I asked our in-house social media expert (my daughter) for a concise analysis, she replied: "It's a f*cking dog. Sell". Woah, sweet child of mine…"
Thanks for that interesting glimpse into the anon household - you sure that white stuff you guys have for breakfast is cereal? Interesting parade of victory laps by hedge fund managers recently who got China 'right' - where is John Burbank these days, BTW? No one calling him from CNBC asking him his opinion on whether crude will fall to to 20, 15, or 10? There is the problem right there - there is no right or wrong in these markets, just up and down based on temporary positioning - don't get used to anything would be my advice. Slightly hawkish. Now to see if being short EM pays. I disagree MrBeach. Not sure if it was even slightly hawkish. The statement truly observes the long-standing 'data dependent" mode, nothing more. I think the Fed is more data dependent than ever and I personally write off labor market being a factor in driving the path towards normalization since I'm certain the Fed will let inflation overshoot beyond 2% in hopes really getting it right the first time - she has reiterated this numerous times. So the fact that the only positive that was cited was in fact the labor market, the upward pressure it may create in wages/inflation is sort of "meh" at this point in time. Obviously Q1 GDP report thats just around the corner will be a stinker... and if you think Q2 rebound is going to be soft and actually in line with current expectations, you can count June out for sure. Now FOMC out of the way, with not much to gear up the dollar bulls again, I doubled down on the long side of eur/usd about 20mins ago. currently work at a multi manager shop, run a small book in the 150mm-200mm range. Also profound thanks to MM and those who keep this community alive. I derive slightly hawkish from the repositioning of the term "global" from front and center in March (first line of the statement) to somewhat buried today (last line of second paragraph). This suggests to me that the Fed is less concerned about China and is back to focusing on the domestic economy - which is doing okay. It is my assumption that the Fed wants to raise at least once or twice more this year. With the desire to not appear to be meddling in the election, I think June has a higher probability than markets are currently pricing. Volumes are shocking outside a bit of fx volatility. Not even a little covering action (save Eurodollar). Meh. @MM 7:35: Dow is up circa +160 since pre-fomc. Spoos and European equity indexes also rising... wait till BOJ, we'll see all risk assets go through the roof once BOJ triple-down. who thinks BOJ will disappoint tonight? Don't do anything stupid tomorrow - and we will raise rates. While I will certainly concede that the SPX has rallied, appealing to the Dow as proof of anything is just beyond stupid. SPX, who cares. Any theories in FI land?! The Fed statement could have been updated by a chatbot. It is as if they didn't want to influence market pricing for June so that the market can tell them what to do. Re BoJ. Not me. I think they go nuclear. The thing still looks cheap from the outside to the cash/ROIC it's producing but you just never know on tech which imho are more prone to sudden changes than some other fields. Anything can happen and past numbers might not be as normalized as analysts tend to extrapolate with rulers. @hipper AAPL evolved into a cash cow stock (as opposed to a growth stock) a few years ago. The thing is, even at 0% topline growth the thing still throws off cash like it's going out of style, and with the world still in NIRP/ZIRP that's pretty attractive. Granted, as a stockholder I'd prefer that they pay it out in dividends rather than spunking it on buybacks, but I guess Carl Icahn has more sway than I do. I have to say, though, that the way my iphone 5 asks me to update software every 3 hours is really starting to piss me off.